This post is the 1st in a series devoted to adapting the literacy tenets of "The Daily 5" to a secondary classroom with 50 minute periods. You can catch the whole series here. "A lot of these apps would be great for getting your Daily 5 work in..."
I was at an Education Technology Conference last February watching +Kathy Knutson and +Holly Camacaro present on their use of iOS apps in their Kindergarten and 3rd graders respectively, and Kathy paused for a moment to see if she needed to briefly summarize Daily 5 for anyone. Exploring even just the Daily 5 website, it quickly becomes clear it is written to elementary teachers with time in their day to go through extended centers - something not feasible for me in a 50 minute class period. Because I work with elementary teachers on the district EdTech Team, I filed it away as useful for perspective, but otherwise ignored it. When we returned to school in August, we were told that one of the goals for the year was a strategic literacy initiative, and that our main tool would be called "Daily 5" - every student reading 5 minutes a day in every class. While that could look like one of the 5 tenets listed above, it felt like an irrelevant add-on to me, so using what I know from my elementary friends, I decided to take one of the 5 "centers" and choose to do ONE for that class period. I can do "Daily 5" during any point of the period. Some days it is my lesson starter, other times it is the meat of instruction, and still others, it serves as a summary/assessment reflection piece at the end of the period. Students see an integration of literacy in their math curriculum instead of just reading in their math class(room). I do not make a point to hit every "5" every week, but I usually get at least three, so students are exposed to diverse literacy activities beyond passive reading. Because literacy is not planned for as an add-on, its effects are more likely to endure and I am more likely to be persistent and consistent in its integration. 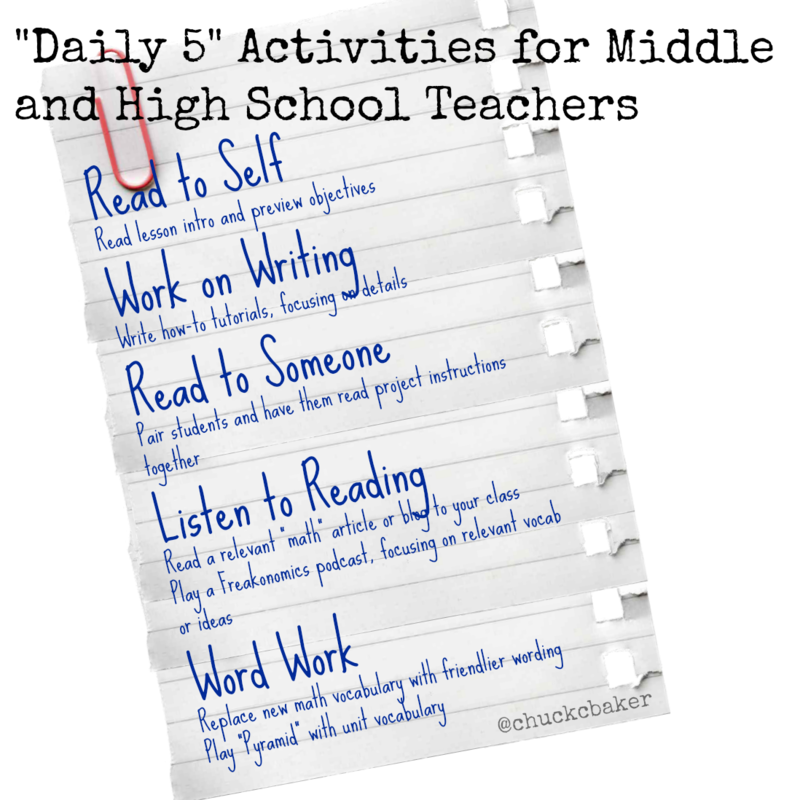 I plan to go into more depth on my literacy and technology efforts as my own Daily 5 presentation with +Abby Erwin at this year's METC conference nears, but just to get you started, here are a few activities I use pretty regularly. I keep a cheat-sheet taped to the chalkboard next to my desk for easy reference while I'm planning - feel free to print this one!